Out of Time. Running In and out of time. This hook to Kung Fury’s over the top theme song (sung by David Hasselhoff) explains how truly outrageous this whole movie is. Clocking in at a whopping 30 minutes it wastes no time in giving every 80’s nostalgic person the fill they need. Funded 100% by Kickstarter backers and the support of Lonely Island, Kung Fury is ridiculously perfect fun to watch over and over. Kung Fury (David Sandberg) is a damn good cop who’s damn good at his job who got struck by lightning and bitten by a cobra at the same time. He is shown visions of Shaolin masters and given the powers to be the best damn martial artist in the world. When Hitler (Lonely Island’s Jorme Taccone) arrives in Kung Fury’s time and kills his cop buddies, Kung Fury must hack back in time to do the only thing to solve all of this. Kill Hitler. I sense some of you are closing this window and stepping away from the computer. Well don’t. 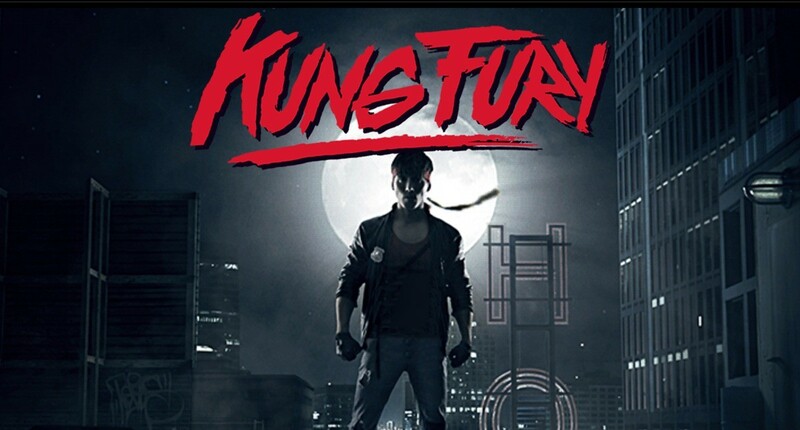 Kung Fury is highly compressed pure fun that is full of laughs from start to finish. There’s literally everything in this movie – Laser Raptors. Viking girls with Gatling guns. A T-Rex having a slap fight with a robotic eagle. And Kung Fury’s new partner, Triceratops cop. Triceracop. All filmed in 1080p – but it doesn’t matter because you get to watch it in full standard definition. Kung Fury is one of the best things I’ve ever seen. It is essentially a Lonely Island film that plays like a live-action Far Cry: Blood Dragon movie, mixed with Kung Fu and insanely hysterical one liners. You must understand that the 100% I am going to give Kung Fury isn’t because it’s ripe for the Oscars, it’s because every once in a while the movies we watch take themselves to seriously and Kung Fury high-kicks us back into reality. Now come with me while I hack back in time and watch the full movie below! For more great behind the scenes stuff, check out David Sandberg’s AMA on Reddit. Kung Fury is highly compressed pure fun that is full of laughs from start to finish. There’s literally everything in this movie – Laser Raptors. Viking girls with Gatling guns. A T-Rex having a slap fight with a robotic eagle. And Kung Fury’s new partner, Triceratops cop. Triceracop. All filmed in 1080p – but it doesn’t matter because you get to watch it in full standard definition.